Snow started to fall in December as a crowd of rowers gathered in Fairmount Park between the condemned East Park Canoe House and the tents the crew and rowing teams have been housed in since 2008. About 100 student-athletes, alumni and supporters milled around, looking at trophies and medals that the programs have compiled in their history. They came together for a rally they hoped would help save the teams that were set to be eliminated in July 2014. Both crew and rowing were cut, along with baseball, softball, men’s gymnastics and men’s track & field. Jordan was one of a group of alumni who had taken an active role in protesting the cuts. 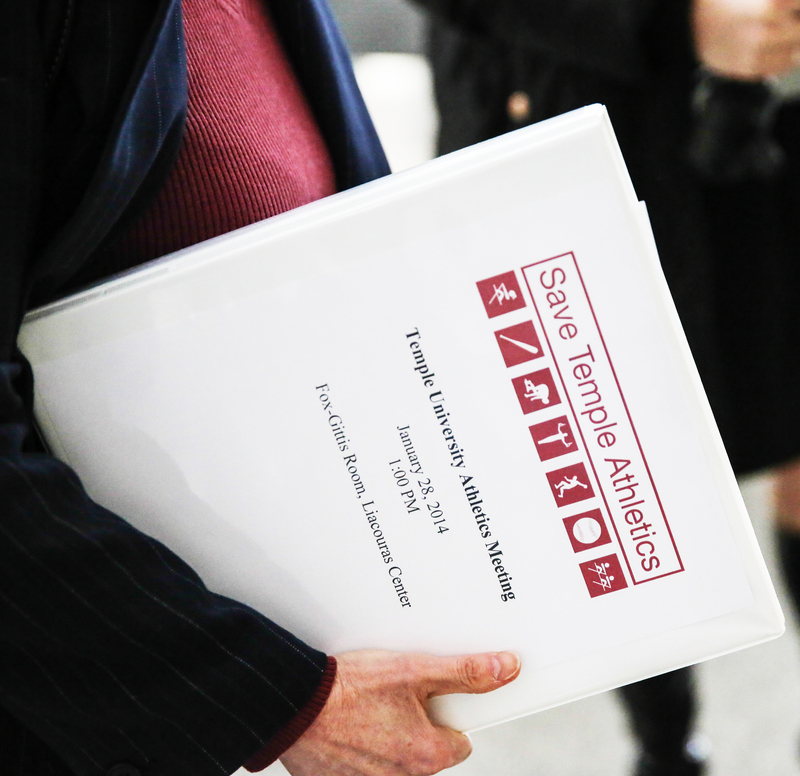 A “Save Temple Athletics” Facebook group was created and quickly gained thousands of members. At one point in the rally, crew coach Gavin White addressed the crowd, telling them the next step would be to contact state representatives to see what they can do. Members of the men’s gymnastics team rallied outside Sullivan Hall before a Board of Trustees meeting in February. Coaches and student-athletes from each of the cut sports teams spoke at the meeting. Finals were done, the semester was over, but the men’s gymnastics team still had plenty of work to do. On a rainy Tuesday afternoon in late December, sophomore Evan Eigner, freshman Misha Kustin and senior Charles Baldi were at the gym inside McGonigle Hall working on their routines. Many of their teammates were home for break, where they worked out in their local gyms continuing to train for the start of the quickly approaching season. More than three weeks had passed since the athletic department announced the elimination of seven sports teams, including men’s gymnastics. Each cut team was making efforts to save their programs, and the men’s gymnastics squad was at the forefront of those efforts. A petition was created that quickly garnered more than 12,000 signatures, as the team reached out to many students and others connected with the university. Reaching the Board of Trustees was a different story. Thirty-eighth-year coach Fred Turoff acknowledged that the petition signatures were nice, but he would rather have the alumni and supporters behind it send letters to trustee members. But the gymnasts’ efforts did little to sway the trustees. A majority of the team, along with student-athletes from other programs, were present at a meeting of the general body of the Board of Trustees the week after the cuts. The student-athletes were not given a chance to offer public comment, though the cuts were discussed briefly by President Theobald. The men’s gymnastics program is allotted a $60,000 operating budget, and the team says it is tasked with raising at least $29,000 of it every year. This past year, the team says it raised nearly $59,000 in donations. The team is also given four scholarships, but Turoff has the ability to divvy them up as he sees fit. Eigner, who is Turoff’s son, receives tuition remission – not a scholarship. Still, a majority of the 19-man roster is paying for some part of their tuition. “We’re really a positive cash flow situation for the university,” Turoff said. The men’s gymnastics team has been one of the most successful at the university. Turoff’s squad has won four Eastern College Athletic Conference titles in the last eight years and 15 since 1990. The program has also run a youth squad for the past 11 years and hosts a Sunday clinic, which gets Philadelphia youth competing and, in some cases, even attracting them to come to Temple. A pile of purple bats sat on a couch in Joe DiPietro’s office. There were about 20 of them, half of the amount that were donated to the softball team. Enough were given that every player got two Louisville Sluggers, which retail for $350. Temple didn’t pay anything for them. Members of each of the affected sports held private meetings with administrators in January to argue why they thought their sports should be reinstated. The bats aren’t the only pieces of equipment the softball team has had donated. DiPietro said the team has received $35,000 worth of free equipment in the past year. That number was one of the sixth-year coach’s main points in a face-to-face meeting with administrators held in January. The biggest point DiPietro made, though, was regarding the administration’s position that traveling to Ambler Campus to compete provides a bad student-athlete experience. DiPietro said he suggested the use of SEPTA’s Regional Rail service as a way to quicken the commute to Ambler. Baseball coach Ryan Wheeler said he has been looking into other potential playing venues. He said he would like to consider more games at Campbell’s Field in Camden, N.J., where the team had scheduled all but one conference game this season. He said he also suggested finding a field in Fairmount Park or partnering with MLB’s Reviving Baseball in Inner Cities program, among other ideas. Crew coach Gavin White said he stressed that his sport has more value to the university than the amount of money it brings in. Men’s gymnastics coach Fred Turoff said his presentation was mainly based around the academic and athletic success of the team. Gabe Pickett, a senior jumper and team captain for the track & field team, said his program’s presentation took a different approach than the other teams. He and his coach, Eric Mobley, talked about how eliminating the team will result in lost opportunities for African-American men. Pickett said he wanted to help the administrators understand what the coaches and players were going through, rather than listing numbers and statistics. 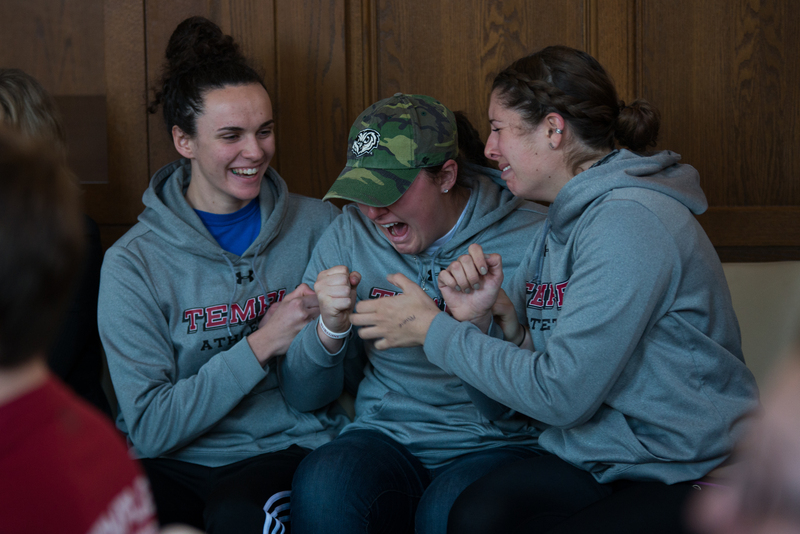 (From left) Rowers Layla Moran, Rachael Braccia and Kelly Hill react in excitement to the news that the men’s crew and women’s rowing teams will be reinstated. The programs were slated to be eliminated this summer before the Board of Trustees reversed its decision. When 34th-year coach Gavin White first learned of the crew and rowing teams being reinstated, his initial thoughts involved the other five teams that weren’t. In an unprecedented move, the Board of Trustees in February approved a motion to reverse the university’s decision to eliminate the crew and rowing teams, effectively maintaining the programs’ Division I status that was slated to be reduced this summer. At a public meeting at Sullivan Hall, the board passed a recommendation made by Theobald to reinstate the teams, two of seven programs included in the university’s December decision to cut sports. Dozens of student-athletes and coaches from the cut sports attended the meeting, but Theobald’s recommendation did not call for reinstatement of the other eliminated sports – baseball, softball, men’s gymnastics and men’s indoor and outdoor track & field. The board’s decision came after weeks of negotiations with the city to house the crew and rowing teams on Kelly Drive in the East Park Canoe House, the Owls’ former home until the building was condemned in 2008. In a news conference at City Hall following the board meeting, Mayor Nutter and Theobald announced an agreement where Temple can share space with the Police Marine Unit after EPCH undergoes a $5.5 million renovation during the next 12–18 months. The city is paying $2.5 million and Temple trustee H.F. “Gerry” Lenfest is donating $3 million. No university money will be used to fund the project. “When things get cut, that’s when you find out who your true friends are,” White said. Grzybowski said there were times since the December announcement of the cuts that she thought the program couldn’t be saved from extinction. At the Board of Trustees meeting where the crew and rowing cuts were overturned, there was an opportunity for members of the public to voice their concerns directly to the board, Theobald and Athletic Director Kevin Clark. Student-athletes from the affected sports hoped they would get a chance to state their case and perhaps sway the opinions of some board members. However, that didn’t end up happening, as all but one present board member approved Theobald’s recommendation to reinstate crew and rowing, but still cut baseball, softball, men’s gymnastics and men’s track & field. The four factors for the cuts the administration has stood behind are inadequate facilities, issues with gender equity, student-athlete welfare and financial commitments. Baseball coach Ryan Wheeler said to the board that he had been told that facilities were the main reason for the cut of his team. When he asked why the offer from the Camden Riversharks allowing Temple to play home games in Campbell’s Field didn’t change the fate of the team, Theobald said the other factors played a role, eliciting groans from the crowd. One of the reasons given in the past for the cut of men’s gymnastics is that the team shares a facility with the women’s team. Theobald has said there is not enough space for both teams. Both McCarthy and Vanderslice said most baseball players will transfer after the season to play elsewhere. “It would be hard to go to school and enjoy coming to a school if they screwed you over before,” McCarthy said.